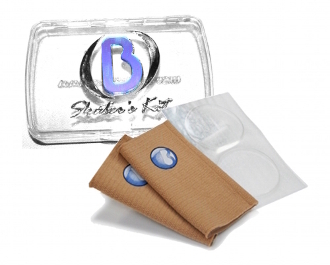 The Bunga Pads Essential Skater's Kit includes (2) 2.5" gel discs, (2) 5" ankle sleeves and (1) Clear BungaBox. These are the most common pads for hockey, figure and roller skaters. Use these core items to break in boots. Ankle Sleeve Measures 3" x 5"
Decreases rubbing and chaffing around your ankles. Effective in protecting against ankle bone discomfort caused by ski boots and skates by equalizing pressure around your ankle and over your ankle bones. Gel Discs measure 2.5" in diameter & protect ankle bones.